Be curious. Embrace the Unexpected. Join us in London September 24-30. Finding new experiences and meeting new people is not always easy in London. Serendipity Week is designed to make it easier to find things to go to and people to go with. Mystery Tickets will take you to carefully selected experiences with other open minded and curious souls, just like you. The Little Deck of Nudges will give you daily nudges to break routine and try new things in new ways. For the last week of September you just need to tell us which morning(s), afternoon(s) or evening(s) you want to join an experience and we'll take care of the rest. You may end up at a soulful piano session in Soho, a graffiti course in Hackney or a whiskey tasting in Battersea. It's not just about the experience though. Over the course of the week, we'll help you to open your eyes to see and appreciate more of what this amazing city has to offer. 'Mystery Tickets' go on sale at the end of May. Select a day and a time-slot and wait to see where we send you and with whom. If you want to volunteer to help during the week or you have an amazing experience that you're trying to attract new audiences to, we'd love to hear from you. Use the form below to register for updates, send your suggestions and request your free Nudge Cards. Leave your details below to join the community and receive updates. Welcome to the Serendipity Week community. We look forward to sharing updates with you and hope to see you for Serendipity Week in the last week of June, 2018. ...is a beautifully and thoughtfully designed deck of behavioural nudge cards created to help us to break routines and see the world from a fresh perspective. Each card suggests a unique 'nudge' that will help you safely toward the edge of your comfort zone or simply to see the things you pass by every day without noticing. As well as the suggestion and instruction, on the back of every card is a research-based explanation for why we chose that activity and what it can do for you. Use this form to send us your details and we will send you a random selection of 3 nudge cards to try and share with your friends. We'll send them for free, anywhere in the world. We'd also love to hear how you used them and what they did for you. We will follow up by email in a couple of months. So far we have helped people just like you to awaken their inner composer, navigator, artist, discoverer and joker. The Little Deck of Nudges are best when shared so tell your friends to request their cards and try them out together. Numbers are limited so we're offering the free cards on a first-come, first-served basis. By clicking 'submit' below, you agree for us to send you your cards by post and to follow up by email for your feedback and with updates about the Little Deck of Nudges. Thank you! Keep an eye on your post box. 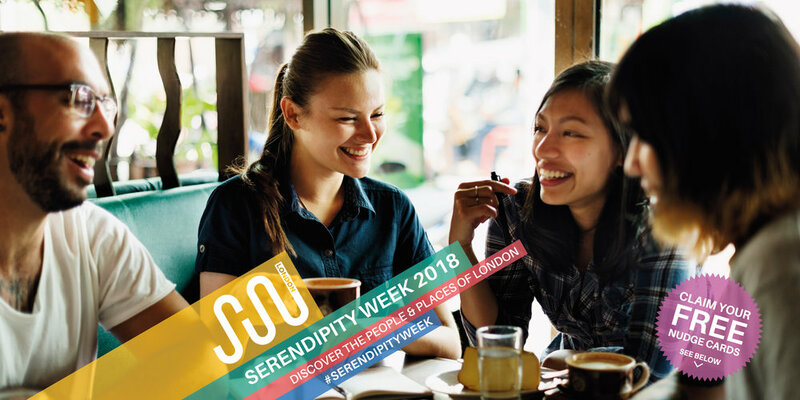 Please spread the word about Serendipity Week and the Little Deck of Nudges. We’d love to have as diverse a group as possible participating. Working to create a better connected world.